I made this card for the Week 4 Viva la Verve Sketch. The stamped sentiment is from Verve's Starlight Starbright Remixed, both stars are up on separate layers of foam tape, and papers On the Bright Side-One by My Mind's Eye. Denise this is a bevy of spectacular elements. Wonderful stitching, elevated elements, twine and sparkly gems! Just FABULOUS Denise! LOVE the bling against that wood paper! 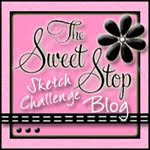 Love the little rhinestone swirls you added...fun! There's that peeled paint paper again! You are such an enabler :) I love that chevron dsp in the background too! Cute! Wonderful sketch card!! 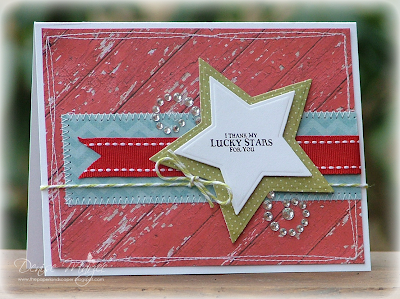 The star die is perfect with that sentiment, and I love the papers and bling! !